This Bride Set A New Trend By Getting Her Wedding Hashtag Embroidered On Her Lehenga! 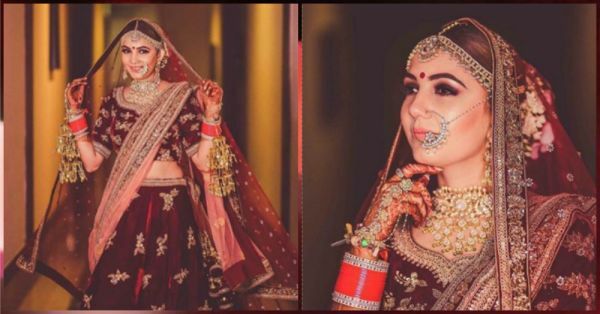 Clearly, there are no limits to creativity and the reason we're saying it is because of the existence of some super-cool brides, just like Priyanka Kamboj. Priyanka, who is a photographer by profession, first shot her pre-wedding pictures herself and left us stunned. Now at the time of her wedding, she decided to embroider her wedding hashtag on her lehenga blouse. Priyanka married her longtime beau Suraj, a lawyer by profession and the hashtag for the wedding was- #kingkiqueen. We discovered that her blouse also had the same hashtag customised on it. Don't believe us? Have a look at our queen's gorgeous bridal couture yourself! 1. Meet our super creative bride Priyanka of Design Aqua Studio! 2. It was Dalmia fashions who customised her wedding hashtag on her blouse! 3. Priyanka made a gorgeous bride in maroon! 4. 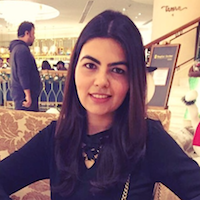 Her bridal make-up was so on point...thanks to Manleen Puri! 5. Her gorgeous bridal jewellery from Raabta by Rahul is goals! 6. Moments before she walked down the aisle! 7. And they are hitched! How cool is this bride!